It’s amazing how we have been blessed by God at Prince of Peace Church. Our small numbers make us wonder what is it that God wants us to do; how do we actively become the hands and feet of Jesus? How do we lead with our hearts and build relationships? 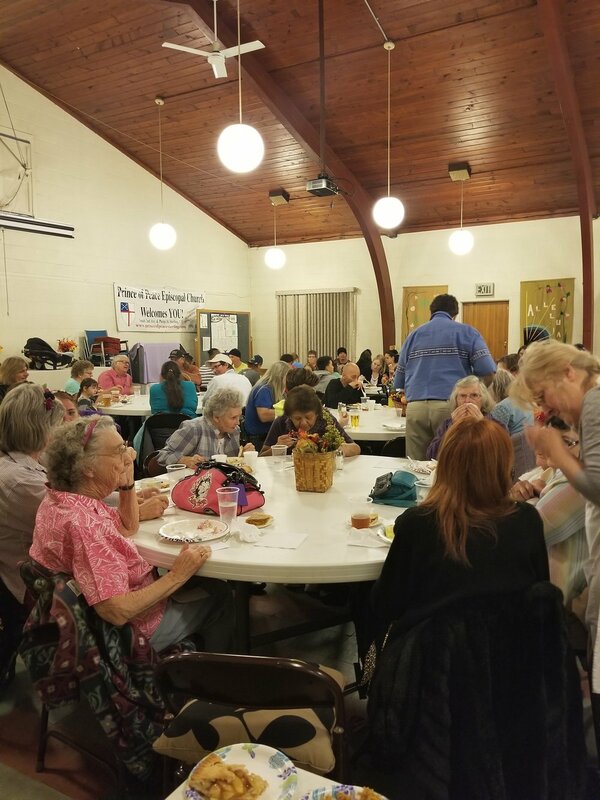 Through much praying, listening and discernment we have been led to partner with the non-profit organization, Under the Umbrella, to feed the hungry, homeless and hurting. This partnership demonstrates how we strive to establish Radical Generosity as a Core Pattern of Life. Prince of Peace Church uses its Parish Hall to serve Under the Umbrella suppers 2x a week. The numbers average about 60 patrons for each meal. People who attend Under the Umbrella suppers enjoy nutritious meals. Some are not able to or do not have the means to cook a meal themselves. Some appreciate eating with others and engaging in social interaction. Our patrons include families with small children as well as the elderly and all ages in between. Religious materials are available to read. In the entry way there is a prayer wall where we encourage people to write their prayers and to pray for one another. All find comfort in being welcomed to a safe and friendly environment. Through these relationships and partnerships we answer the call to God. We become the hands and feet of Jesus as we build relationships inside and outside of our church. Interested in volunteering ? Need more information?